Sri Lanka has only recently begun its ascent into becoming a must-visit destination for travellers around the globe, so now is the perfect time to experience the country. Be one of the first of your friends to explore the country’s beaches and jungles as well as their vibrant local culture and nightlife before word gets out and tourists start pouring in. Sure, you can find the odd McDonalds to feed your hunger for nuggets in Sri Lanka, but it won’t be hard to find an authentic Sri Lankan experience during your trip. Unlike nearby India, which is abundant with giant shopping centers and Western fast food joints, Sri Lanka has held steadily onto their distinct culture. From small shops selling locally produced food and clothing to historic cave temples, Sri Lankans are all about showing off what makes their country unique. Sri Lankans are a friendly and welcoming group of people, so don’t be shy about making friends with some locals. Chances are they’ll be able to clue you into some of their country’s best kept secrets, like where to go for an epic night out, the best surf spots, and where you can score some of the best fish curry in the country. Play your cards right and you may even be able to join in on a local cricket match. There’s a photo op at every corner in Sri Lanka. Pick the aesthetic, you’ll find it here: sprawling cityscapes, scenic sunsets, untouched greenery, immaculate beaches, and so many roaming animals it’ll feel like David Attenborough took over your account. Book your tour and get ready to rake in the likes. If you’re idea of a good time involves scaling a mountain, traversing a rainforest, strolling through tea plantations or lounging on the beach, Sri Lanka has you covered. Sri Lanka possesses every type of landscape you can hope for. Check out Adam’s Peak for some climbing, grab a cup of tea at Nuwara Eliya, arrange a safari through the Sinharaja Rain Forest, or work on your tan on some of the most beautiful beaches in the world! 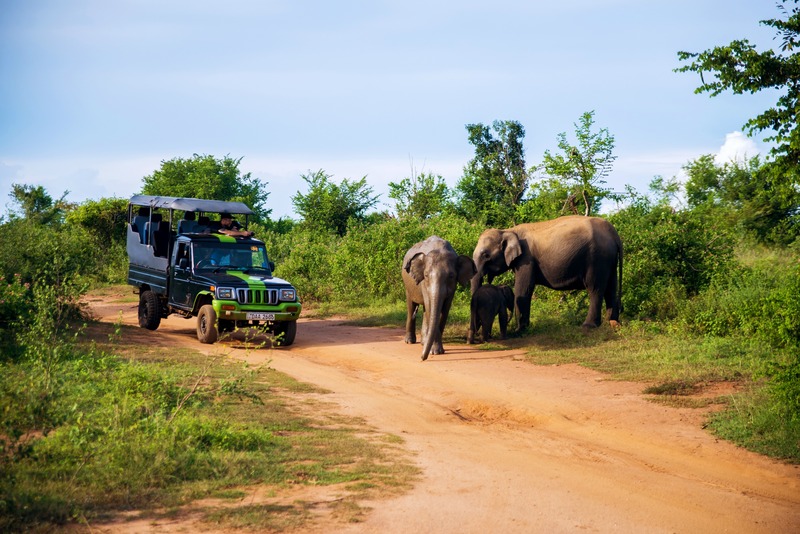 With 26 national parks covering more than 5,000 square km, Sri Lanka is a haven for wildlife. The country has a lengthy checklist of animals to spot: keep an eye out for elephants, leopards, whales, and hundreds of different birds. And when in Sri Lanka, make sure to seek out some of the country’s takes on some old favorites like the sloth bear, fishing cat, giant squirrel, and flying snake. Are you ready for this once-in-a-lifetime adventure? Check out our amazing Sri Lanka trip here!